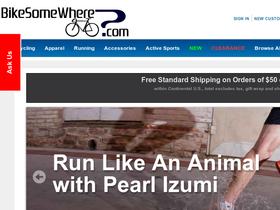 BikeSomewhere, online at bikesomewhere.com, is the ultimate bike shop. BikeSomewhere, offers all the bike parts and accessories that you could ever imagine. BikeSomewhere even offers gear for other sports including skateboarding, skiing, hockey, snowshoeing, and more. BikeSomewhere offers bike accessories including helmets, baskets, pumps, tires, and all the equipment you need for training. So checkout all the awesome products that BikeSomewhere has to offer. But remember to stop by RetailSteal to find the best BikeSomewhere promotions, BikeSomewhere discounts, and BikeSomewhere coupon codes. Get free shipping on your BikeSomewhere orders of $75 or more. Standard shipping as well as expedited shipping are available options. See website for full details, exclusions may apply. Shop online at BikeSomewhere.com and save up to 30% off a wide range of cycling accessories. At BikeSomeWhere, use this code to get 5% off sale items. Click link to purchase. Save 5% on your BikeSomeWhere purchase of $50 or more when you use this promo code! Shop the clearance selection at BikeSomewhere and find a selection of products for under $10. Click to save. Shop the sale section at BikeSomeWhere online today and save up to 25% on merchandise. Shop for running shoes at BikeSomeWhere and find prices as low as $69.